GenreOnline.net: DC Celebrates the Big Screen Release of JUSTICE LEAGUE with Special JUSTICE Variant Covers in November! DC Celebrates the Big Screen Release of JUSTICE LEAGUE with Special JUSTICE Variant Covers in November! with Special JUSTICE Variant Covers! 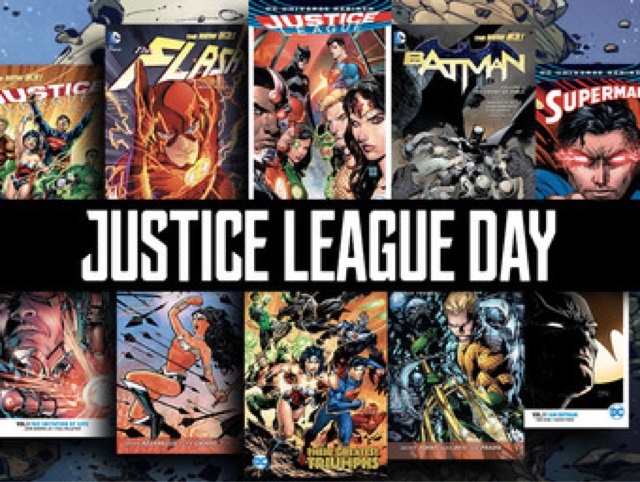 As the world awaits the big screen debut of “Justice League,” DC is getting in on the action with a special collection of variant covers inspired by the forthcoming film! Illustrated by the some of the comic industry’s most acclaimed artists, these variant covers showcase DC’s iconic Super Hero team in the likeness of their big screen counterparts. Fans are getting their first look today at variant covers available on the November editions of flagship DC titles featuring members of the famed Justice League. ENTERTAINMENT WEEKLY first debuted the special variant covers for BATMAN #34 by Tony S. Daniel and CYBORG #18 by Dustin Nguyen – both go on sale Nov. 1. NERDIST joined in by revealing the special variants for ACTION COMICS #991 by Yanick Paquette (on sale Nov. 8) and SUPERMAN #35 by Renato Guedes (on sale Nov. 15). THE HOLLYWOOD REPORTER debuted Mike McKone’s variant for THE FLASH #34 (on sale Nov. 8) and Terry Dodson’s special cover for WONDER WOMAN #34 (on sale Nov. 22). Plus, JoinTheLeague.com revealed the variants for AQUAMAN #30 (on sale Nov. 15) by Liam Sharp and JUSTICE LEAGUE #32 by Howard Porter (on sale Nov. 1). Finally, DC exclusively revealed the variants for TRINITY #15 by Ben Oliver (on sale Nov. 15), alongside the variant for DETECTIVE COMICS #968 by Cully Hamner (on sale Nov. 8). Why did I decide to repost that article? Twin Peaks Season Three Blu-ray and DVD art. Twin Peaks: The Return: Raw Thoughts. First Mover. First Maker. Book Trailer. Just as living creatures in nature evolve, so do websites. With an eye toward convergence using the many features Google offers at no cost to it's users, which are unparalleled, I am developing this site to be a multimedia experience across many platforms. My name is Mark Rivera and I do a lot more than review statues. I review films and television and I interview genre film and TV personalities both in front of and behind the cameras. I am also an Author. Along with the companion YouTube channel, this website will serve as a conduit that will unite things as they come and are practical and or are a good match. Hopefully you all will agree and enjoy as I take GenreOnline.net one step beyond the normal website and YouTube channel of this type and innovate where necessary. (C) Copyright 1999 - 2019 By Mark A. Rivera. All Rights Reserved. Awesome Inc. theme. Theme images by sololos. Powered by Blogger.